About a week ago I was spending hours upon wasted hours browsing Pinterest, when I came across this beautiful cake from the wonderful Tracy aka Shutterbean. I see so many different recipes that it really takes a lot for me to want to click through to the website and not just move onto the next. 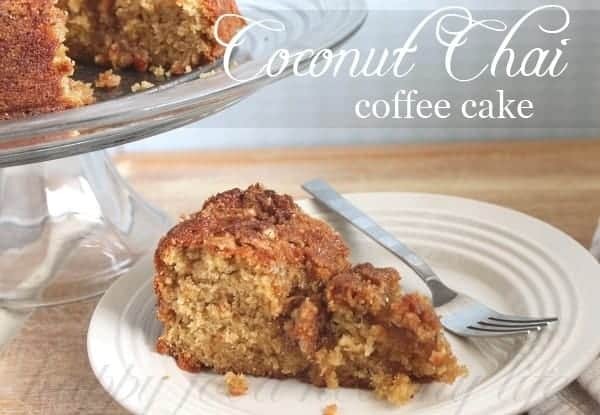 Well, with two of my favorite flavors – coconut & chai – and some beautiful alluring photography, I just couldn’t help but check out the details. 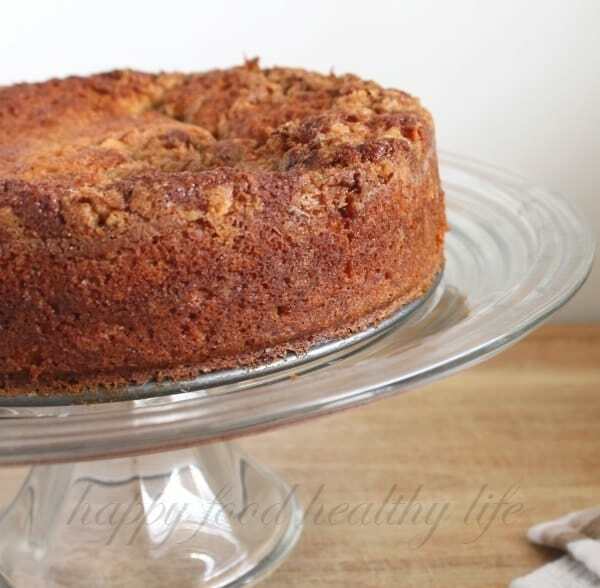 Really, all I had to see was that this cake had a streusel topping, and I was sold. This cake would by made and consumed in my very near future. That future happened to fall this past weekend, and oh my, I would love to just stop time today – the day this cake was made (and almost consumed in its entirety immediately). No, I did find some sort of self-control and allowed just one delicious heavenly slice. How amazing it was. Each chai-inspired spice was noticed. I especially noticed the cardamom and it’s slight citrus-y notes. I couldn’t find any at the store when shopping for ingredients, and almost did without. I realized later, after searching deeper in my cabinets, that I actually had some already. I am so glad I searched because that taste was something I would have missed. I have a feeling this cake will be a staple in my line-up of go-to’s. I want to share it with everyone. I want everyone to know the amazingness that is this cake. Since I can’t physically make it for you all, I invite you to get in your kitchen, bake it yourself, and share it with your loved ones (after you’ve gotten your own piece, of course)! Heat the oven to 350 degrees F and arrange rack in the middle. Coat a 9-inch spring-form pan with butter and flour and set aside. Combine all streusel ingredients in a small bowl and mix until well incorporated and clumped. Refrigerate until ready to use. For the cake: Whisk together flour, baking powder, baking soda, and salt in a medium bowl until aerated and lumps are broken up; set aside. Put the medium sugar and butter in the bowl of a stand mixer fitted with a paddle attachment and beat over medium speed until light and airy. Add the yogurt and mix well. Add the eggs and vanilla and mix until combined. With a spoon or rubber spatula, stir in the flour mixture until just moistened through. Do not over mix. Transfer the batter to the prepared pan and spread evenly. Sprinkle the streusel over the top and press into the batter slightly. 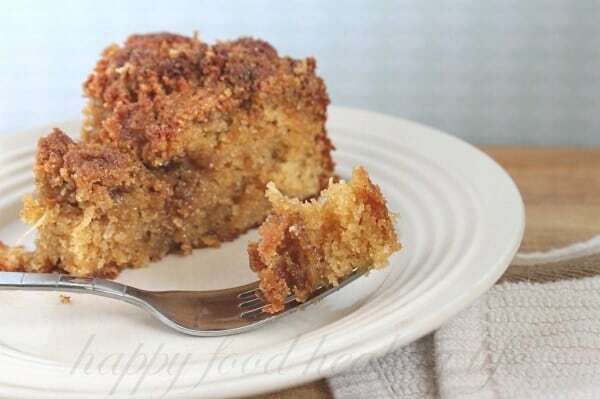 Bake until a toothpick inserted in the center comes out clean and just a few crumbs remain. 50-60 minutes. Transfer to a rack and cool at least 20 minutes before unmolding from the pan & serving. This is such a gorgeous cake, and it sounds SO good! Thanks Dorothy! I kinda wish i had some of it right now. Would be perfect for an after dinner snack. Going to try this gluten free.